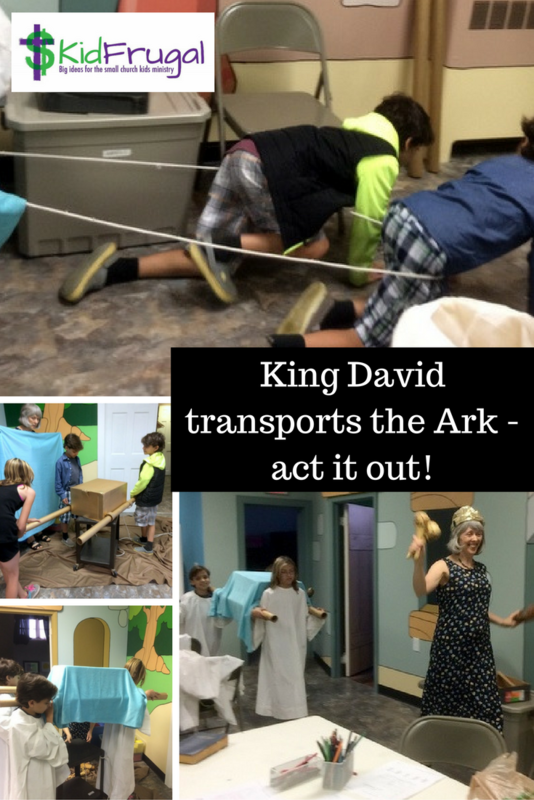 I made this ark of the covenant for our lessons about crossing the Jordan River, so we just reused it. It doesn't have the cherubim to go on top, but it does have the 2 poles and the 4 rings that they were inserted through in order to carry the ark as God had instructed. 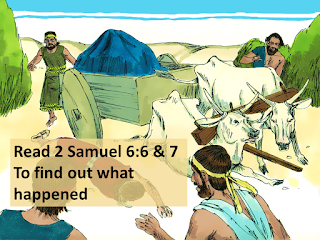 In the story of bringing the ark to Jerusalem, found in 2 Samuel 6, the priests do not transport the ark as God had instructed in the Bible. They put it on a new cart instead. You probably have lots of carts hanging around your church that you could use. An old AV cart, microwave cart, or anything on wheels. We hooked up a rope to the cart so our "oxen" could pull it. The cart made it to the first corner of our JAM Center where a large sheet was on the floor, representing the threshing floor of Nacon. Here the oxen tripped and jerked the cart. One of the kids (actually it was me - we were short on kids) reached their hand out to steady the cart, and of course fell down dead. Then we began part 2. 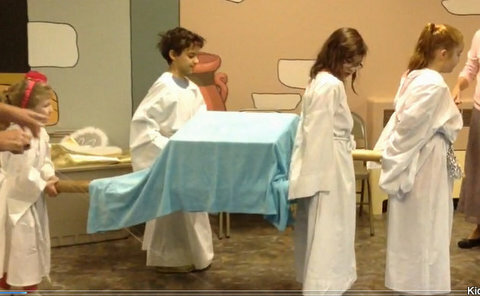 THIS time we put the poles into the Ark as God had instructed, and the priests carried it on their shoulders. You can see the AV cart we used under the ark in these 2 pictures. Now came the best part. I handed out percussion instruments, put on the David Crowder song, Undignified, and we took the Ark to Jerusalem. As the song played, King David led the procession shaking his instruments, praising the Lord. Since we were so short on kids, we let the priests have instruments too. This song is perfect for this activity since this is the event that spawned its composition. We did this with only 3 students, but you could easily act it out with 20 or more. The Ark traveled around and around the room until the song was over, and then we placed it on its stand in Jerusalem (which was wherever I said it was).